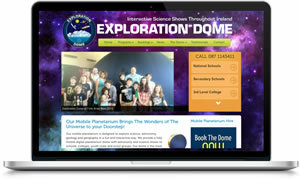 We recently built a website for a new Mobile Planetarium startup business, based in Co Clare. The owners, Martin and Debby, wanted a site that was easy to navigate and could be updated easily. We designed and built the new site in WordPress, which allows straightforward editing of all content. Also, the integrated blog section allows events and articles to be added without fuss which means fresh content is being added to the site regularly, which is great for Search Engine Optimisation (SEO). For more information, or to hire Exploration Dome’s unique Mobile Planetarium, give Martin and Debby a call on 087 1143411.